If your car is worn out, high mileage, damaged from a car wreck, or ready for the scrap heap we will buy the junk car for cash. We remove vehicles that are all years, makes and models including: Cars, Trucks and SUVs. The value of the car is determined by the salvage value. Some cars are salvaged, some are turned into scrap and some are junked. That junk car that is rusting on the front yard is worth cash. Call us now with the make, model and year of the vehicle to determine the value of your car (401) 295- 4174. Removal is always fast and free. To get a quote takes only a few minutes. To learn why we are the best place to sell a junk car visit our About Us page. Cash. 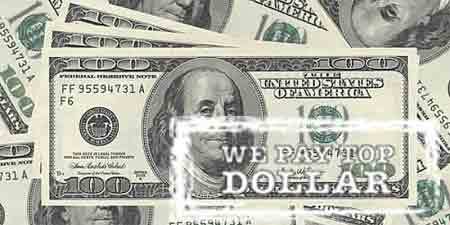 We pay top dollar. Fast. We pick your car up quickly. Responsible. Your car will be disposed of in an environmentally manner that complies with the law. This site is for advertising purposes only. Parts are located at Kingstown Auto Recycling.